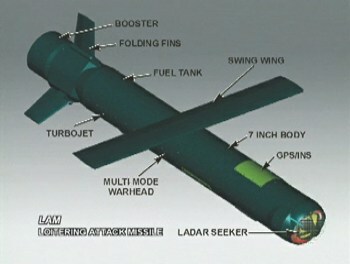 The U.S. Army's PAM (Precision Attack Missile) and LAM (Loitering Attack Missile) are both part of the NetFires NLOS-LS (Non-Line-Of-Sight Launch System). They use the same infrastructure and support equipment and are therefore discussed together. NLOS-LS, formerly known as Advanced Fire Support System and begun in 1997, is a DARPA/U.S. Army technology demonstration program for a new non-line-of-sight missile system to be used by the Army's new mobile FCS (Future Combat System). It uses a common vertical-launch CLU (Container Launch Unit) with integrated command and control equipment and 15 tubes for PAM and/or LAM. Both missiles are about 1.5 m (5 ft) long, have a diameter of 18 cm (7 in), and weigh around 45 kg (100 lb). The missiles use a low-G method of launch ("soft-launch") to minimize stress on the launch canister and vehicle. Both PAM and LAM are equipped with a GPS navigation system and a two-way datalink. With the GPS, the missile can be launched to a general target area with high precision, and the datalink enables targeting updates by any kind of forward observer, like e.g. surveillance UAVs, automatic sensors or forward personnel. The PAM is armed with a large multi-mode warhead and is to be used primarily as an anti-armour weapon. It is powered by a novel variable-thrust solid-fueled rocket motor (by Aerojet General) and has a range of about 40 km (25 miles). The original specification called for a 60 km (37 miles) range, but that has been postponed to a future PAM development. PAM is equipped with a dual-mode UCIIR/SAL (Uncooled Imaging Infrared/Semi-Active Laser) seeker, including ATR (Automatic Target Recognition) technology. Therefore it can home on its target either autonomously or be guided to it by a forward laser designator. The LAM will use extendible wings and a miniature turbojet engine for a cruise endurance of at least 45 minutes. Loitering time at 70 km (45 miles) distance will be about 30 minutes, and maximum range will be about 200 km (125 miles). It will be equipped with a LADAR (Laser Detection And Ranging) seeker and ATR (Automatic Target Recognition) logic to autonomously search and detect potential targets within a predesignated area. The first Raytheon LAM test vehicle flew in June 2002, and Lockheed Martin's LAM design first flew in November that year. The first Raytheon PAM flight test occurred in November 2002, followed by a second one in May 2003. In the same month, Lockheed Martin and Raytheon formed Netfires LLC, a joint-venture company to manage the Netfires program. Testing continued through 2003, and in March 2004 Netfires LLC was awarded an SDD (System Development and Demonstration) contract by DARPA. 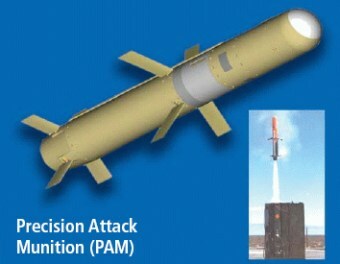 Raytheon will develop PAM, while Lockheed Martin is responsible for LAM.